Experience our blend of aromatic dried chiles, velvety pumpkin, roasted pumpkin seeds, and warm autumn spices. 1. Preheat oven to 425°F. Toss cauliflower florets with olive oil and salt. Place on a cookie sheet and roast in oven until tender and golden, approximately 15 minutes. 2. To make sauce, warm SALSAOLOGY Pumpkin Mole Sauce In a medium sauce pot over medium low heat. Using a whisk, add in mascarpone cheese and mix until well combined. If necessary, adjust seasoning by adding salt to taste. Continue to cook sauce for 5 minutes, remove from heat and cover to keep sauce warm. 3. Cook gnocchi according to package instructions. Once gnocchi is cooked and ready, transfer gnocchi to sauce pot. Add cauliflower florets and mix with sauce to insure gnocchi coats evenly well. 4. 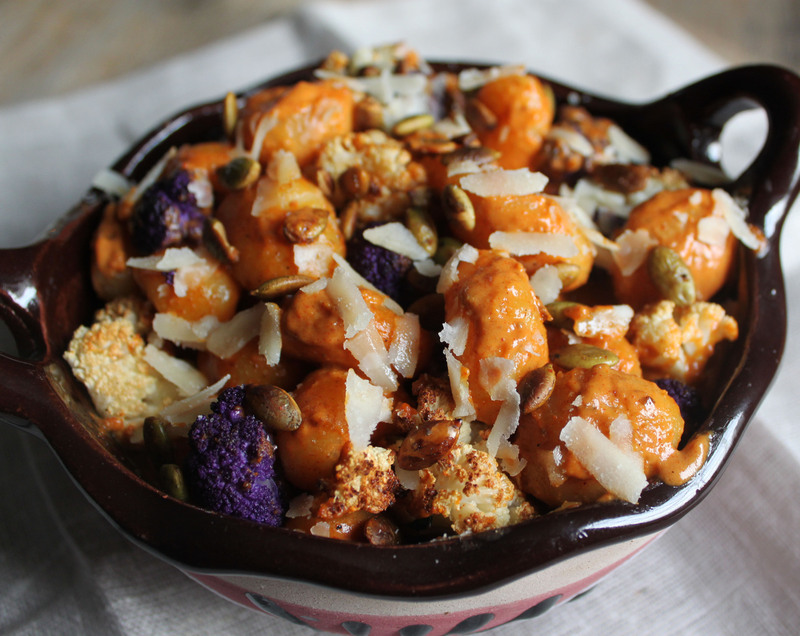 Serve gnocchi and cauliflower warm in bowls. 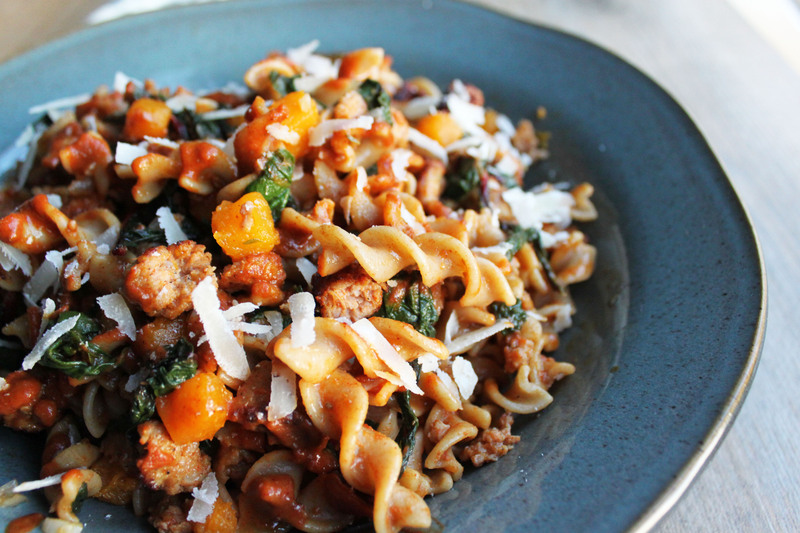 Garnish with grated parmesan cheese and toasted pepitas. 1. Heat 1 tablespoon of oil in a pan over medium heat. Add onions and kale and sauté for 3 minutes. Season with salt to taste. Add chicken stock and continue to cook until kale cooks through, approximately 4 minutes. Add shredded chicken to vegetables and mix together, continue to cook until chicken is warmed through, another 3 minutes. Transfer filling to a bowl and set aside. 2. Heat 2 tablespoons of remaining oil in a pan over medium high heat. Using tongs, submerge a tortilla in oil, turning once, frying for 5 seconds on each side. Tortilla will slightly puff up and become pliable. Transfer tortilla to a plate lined with paper towels to cool. Repeat for remaining tortillas. 3. In a small sauce pot, heat SALSAOLOGY Pumpkin Mole Sauce. Pour about 1 cup of the sauce into a skillet or pie dish. Dip each tortilla into Pumpkin Mole Sauce, turning to coat both sides. Place 2 tablespoons of the chicken and kale filling each in the center of the tortilla. Roll up tortilla with the seam side down and transfer to a platter. Repeat until all enchiladas are completed. 4. 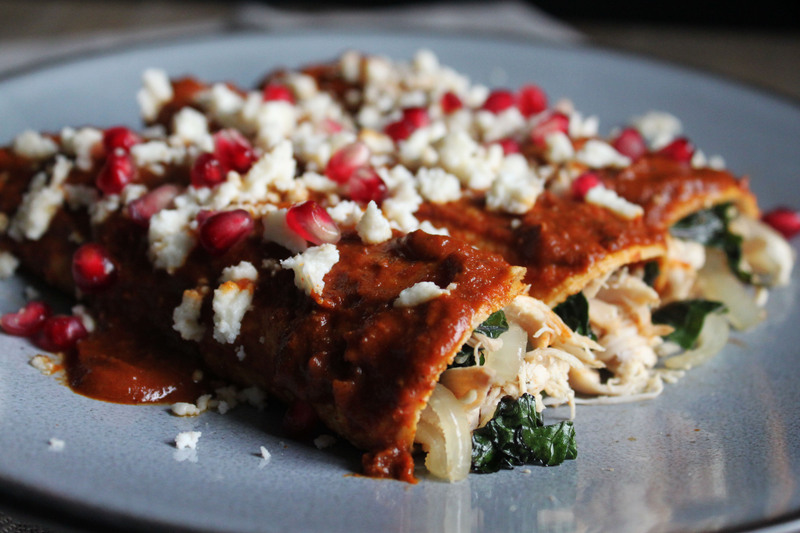 Pour remaining sauce over enchiladas and top off with queso fresco and pomegranate seeds over top of enchiladas platter. Serve immediately. 1. Heat 1 tablespoon oil in a large skillet over medium high heat. Add sausage to skillet and break up meat into small pieces with a wooden spoon. Add salt to taste, stirring often and continue to cook until cooked through and browned, approximately 7 minutes. 2. Remove the sausage from the skillet and pour off excess fat from the skillet except for 1 tablespoon. Return skillet to medium heat. (If using chicken or turkey sausage, add 1 tablespoon of oil). Add onion and cook until translucent, approximately 3 minutes. Add garlic, butternut squash, salt and thyme leaves. Pour chicken stock in to pan and bring to simmer. Cook until squash is fork tender, about 10 minutes. Add red chard and cook for 1 minute and return cooked sausage to skillet. Add SALSAOLOGY Pumpkin Mole Sauce, lower heat and cook until sauce comes to a simmer. 3. Cook the fusilli in large pot of salted water until al dente. Drain the pasta and add to skillet, mix well to coat. Serve warm and top with shaved cheese. 1 Store Bought Rotisserie Chicken. 1. Simmer SALSAOLOGY Pumpkin Mole Sauce over low medium heat in a saucepan until warm about 4 minutes. 2. Pour over rotisserie chicken and enjoy with rice and warm tortillas. Dinner in Under 15 minutes! Made with love and sunshine in Los Angeles, California.